"Behold a pale horse, and he that sat upon him, his name was Death, and hell followed him." - Revelation 6:8. It's summertime here in State College, Pennsylvania. Yet, on Sunday as I was driving home from the gym, my car was suddenly and relentlessly pelted by small pieces of ice - hail. 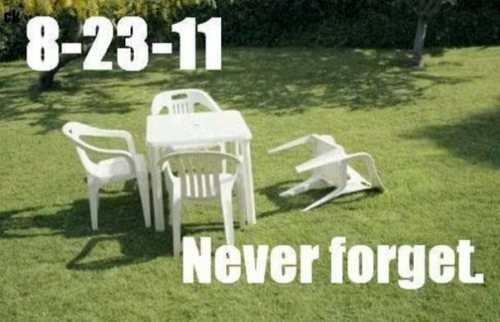 Then on Tuesday, we were hit by an earthquake (you can only imagine how often we get hit with earthquakes here in central Pennsylvania). Now, the Northeast is about to get hammered by Hurricane Irene. 16 Best Practices for Conquering the Next Natural Disaster - Eric Meyer, The Employer Handbook. Some are taking this lightly (see picture, which I will credit to "Every single one of my friends on Facebook" or alternatively "The Internet.") If you have a post that covers workplace disaster preparedness, please feel free to drop a comment.